If you are looking for the friendliest and most family-oriented theme park in the country, you will want to make your way to the Ozarks and Branson Missouri. Silver Dollar City is filled with the old time charm and hospitality that you would have received in the late 1800s. Travel back in time with us as we take you on a virtual journey of Herschend Family Entertainment’s hub park. Silver Dollar City came about in the late 1800s with the discovery of a cave in the Ozarks known as Marvel Cave. The cave was originally a hopeful treasure chest of iron and ore, but as the cave was mined, no ore was found and only limestone prevailed. The mining companies that had put their funding into the cave had to cease operations and the cave sat dormant beginning in 1889. That same year, dairyman and entrepreneur William Henry Lynch decided to purchase Marble Cave and at least one mile surrounding the cave. He wanted to make the area into a tourist attraction. They began a sightseeing tour in 1894, but the tours were not profitable and he shut the attraction down until 1900. When Lynch had more capital, he resumed the tours and the cave has remained opened ever since. The cave is on the United States Natural Landmarks list. When Lynch died in 1927, the ownership transferred to his daughters who ran the company until Hugo Herschend purchased a 99 year lease on the cave. In 1955, Hugo passed away and his wife took over the control of the cave and all of the operations. She had a vision to create more than just a cave tour. She and her two sons, Pete and Jack, began to add things like a train to pull guests up from the cave. As more and more guests came to the Ozarks, they wanted to make something to focus attention on the cave and this would come in the form of a theme park. The family began to build “Ozark Village,” which would be an 1880’s themed park that would spare no fake storefronts or have any falsities in regards to the area. The family wanted to depict what the place looked like when the cave was first opened in 1883. The park was opened and in 1960, the idea of giving Silver Dollars to the guests as change spurred the name change to what it is today, Silver Dollar City. In 1972, the last of the Lynch daughters passed away and the company was given to the Presbyterian Church and College of the Ozarks. The Herschends continued to operate the park. Today the park is a smash hit and a true family-friendly park. When you step into the park for the first time, you are swept away to another time period where the staff are all decked out in 1880s attire and the rides and attractions have that western theme all over. The park includes six roller coasters including Outlaw Run, the newest and most twisted wooden coaster built to its day. 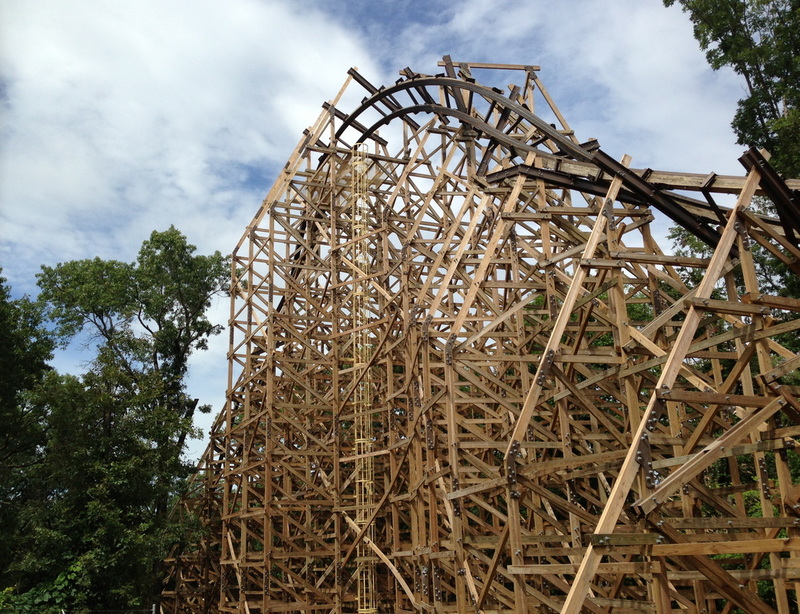 The park also has a B&M coaster called Wildfire and a launched coaster known as Powder Keg. The park has many great flat rides, like the Giant Barn Swing, and water rides like American Plunge. You are sure to be immersed in the past and have the time of the future at Silver Dollar City.